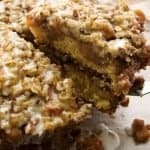 This cake has as apple pie layer and a crunchy streusel topping. It also has swirls of cinnamon throughout it. This recipe has several steps, but it’s so worth it. 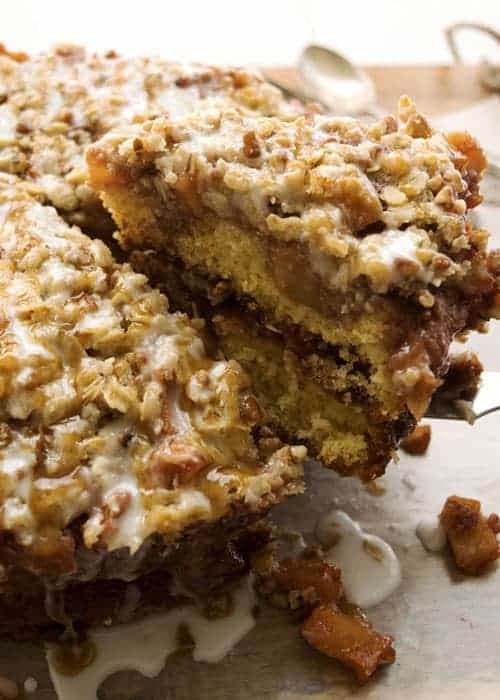 The Apple Crunch Cake has a layer of apple pie filling along with a crunchy streusel topping. Cinnamon sugar is swirled throughout the buttery yellow cake making it perfect for fall. Preheat the oven to 350 degrees. Start with the apple topping. Start by prepare the cake pans. Line them with parchment paper and grease well. The apple mixture is pretty sticky so the parchment paper is a life saver if you want to remove the cakes from the pans. Set the pans aside. Prepare the apples by peeling them and chopping them into cubes. Throw them into a medium pt on the stove. Mix together the cornstarch and water in a small bowl to make a slurry. Add the slurry to the apples. Put the cinnamon, sugar, lemon and salt to the apple pot. Turn on the heat to medium-high and simmer for 15 minutes. 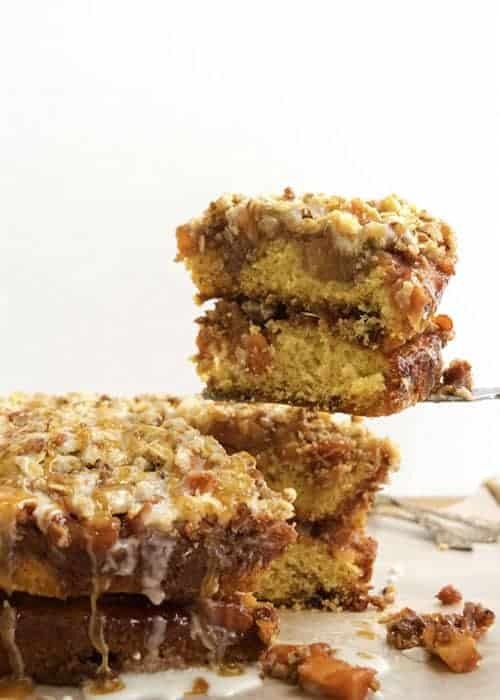 While the apple are cooking mix together the streusel ingredients (flour, sugar, oats, pecans, salt, and butter) using your fingers to break up the butter cubes in a medium bowl. Keep the stresuel refrigerated until further use. In another microwave safe bowl make the cinnamon swirl by melting 4 Tablespoons of butter. Mix 1 Tablespoon of cinnamon and 1/4 cup of sugar into the melted butter. Prepare the yellow cake according to the box. Spread the batter evenly in the two cake pans. Dollop the cinnamon swirl into the batter. Using a knife swirl the cinnamon around in the batter. Do not completely mix the cinnamon in. You should see pretty swirls. Bake for 15 minutes. After 15 minutes, take the cakes out of the oven, and spread the apple toping evenly over each. Then grab the struesel out of the fridge, and sprinkle evenly over each cake. Bake for another 15 minute or until the top has browned a little. Let the cake cool completely before removing from the pans. To remove from the pan, run a knife around the outside of the cake to make sure the sides are loose. Place a dinner plate upside down on top of the cake pan. Flip the cake onto the plate, and take the pan off. Remove the parchment paper from the bottom of the cake. Gently, flip the cake right side up onto whatever surface you plan on serving the cake. Repeat the same process with the plate for the second cake. Place the second cake on top of the first layer of cake. Finish the cake by adding a glaze on top. Mix together 1 cup of powdered sugar, 1 teaspoon of vanilla extract, and 3 teaspoons of warm water. If the mixture is to thick add 1 more teaspoon of water. 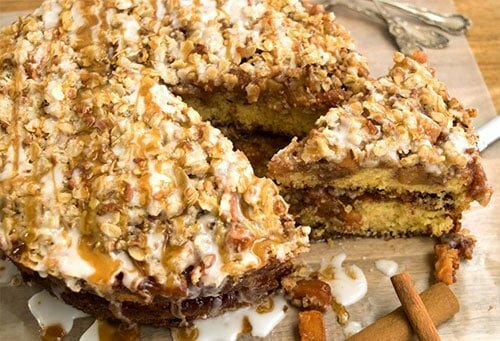 Drizzle the glaze on top of the cake and enjoy your hard work! *For an easier version use a 9×13 cake pan. That way you don’t have to worry about stacking the layers. You would just skip removing the cakes from there pans. Go straight to glazing the top of the cake!